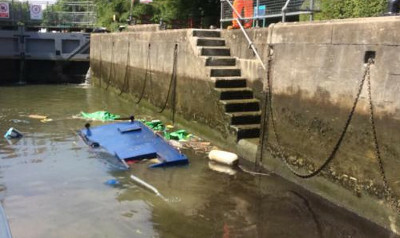 A BOAT carrying gravel sank in Clifton Lock on the Thames, closing the lock. It is thought the boat caught on the cill, and with just one man on board and no lock keeper present, it sank, Alan Tilbury reports. A witness to the incident told that the man had opened the paddles and then climbed back on to the boat, so there was no one there to close the paddles as the boat went down. It is understood he climbed up the steps when realising what was happening, but it was then too late. It is not known if the boat has yet been lifted out of the lock. Many locks on the Thames have only occasional lock keepers with more and more being boater operated.